Google takes a hybrid approach to research - research happens across the entire company, and affects everything we do. As one example, we have a group that focuses on mobile interaction research. 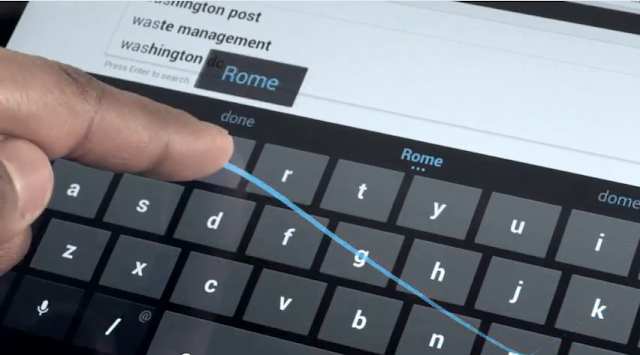 With research backgrounds in human-computer interaction, machine learning, statistical language modeling, and ubicomp, the group has focused on both foundational work and feature innovations for smart touchscreen keyboards. These innovations help us make things like typing messages on your Android device easier for hundreds of millions of people each day. We work closely with world-class engineers, designers, product managers, and UX researchers across the company, which enables us to rapidly integrate the fruits of our research into the Android platform. The first major integration was the launch of Gesture Typing in Android 4.2. Rapidly developed from basic concepts up to product code, and built on years of Android platform groundwork on input method editors (IME) and input method framework (IMF), Gesture Typing uses novel algorithms to dynamically infer and display the user’s intended word right at the fingertip. Often the intended word is displayed even before the user has finished gesturing--creating a magical experience for the user. Seamlessly integrated with touch tapping, Gesture Typing also supports two-thumb use.